How did you come to a relationship with Jesus? I grew up in the church and learned about Jesus from a young age. I encountered Jesus in high school during a hard time in life and loved Him then. I was involved in youth group and church on Sunday and had awesome leaders that loved me and taught me important lessons. However, it wasn’t until college that I really made my faith my own and began a relationship with Jesus. Then I started to truly spend time with Jesus daily - reading the Word and praying and just giving my life to Him. I grew to know Him and love Him more and more. What lead up to that decision? When I got to college I tried to be dedicated to my faith even amongst all the new temptations and things that were pulling for my attention. I joined this awesome group of believers that was just starting up a group on my campus. But I didn’t have that daily communication with Jesus, an actual relationship to sustain me. So I fell into temptation at times, stayed dedicated at others, and felt torn many times. I partied, but not too hard. I attended my campus ministry, but wasn’t serving. Near the end of my sophomore year, I was assaulted. That shook me. That caused me to live in shame, daily. And I recognized that I was giving only half of my life to God and the other half to the world, but I didn’t change. Later, at the beginning of my senior year while at a camp, I was present when someone drowned. That shook me, too. I questioned life. And when it seemed too hard, God spoke in divine ways through others to show me that I didn’t have to live in shame or fear. He showed me how deep his love is for me. Finally that semester, I gave my whole life to the Lord and pursued a true relationship with Him. What in your life is different now and what would you tell your younger self? I don’t live in shame anymore, and I don’t feel torn between two lives. I know that I am truly loved by God, and that gives me the confidence to be myself and to live the life I was called to live. I also have a community and a group of friends that encourages me, prays with me, and betters my life rather than tearing it down. I would tell my younger self that there is nothing the world has to offer that is better than God. I would mostly tell myself that God’s love for you is real, intense, true, and everlasting. Embrace it - he’s calling your name. Why are you excited to serve at Hilltop? Jesus calls us to serve, and I’m excited to follow that calling. I’m excited because serving stretches me and pushes me out of my comfort zone, and the end result is always a deeper relationship with Jesus and with my community of friends. Serving makes me feel like I have a purpose at the church and that I’m really a part of the community. 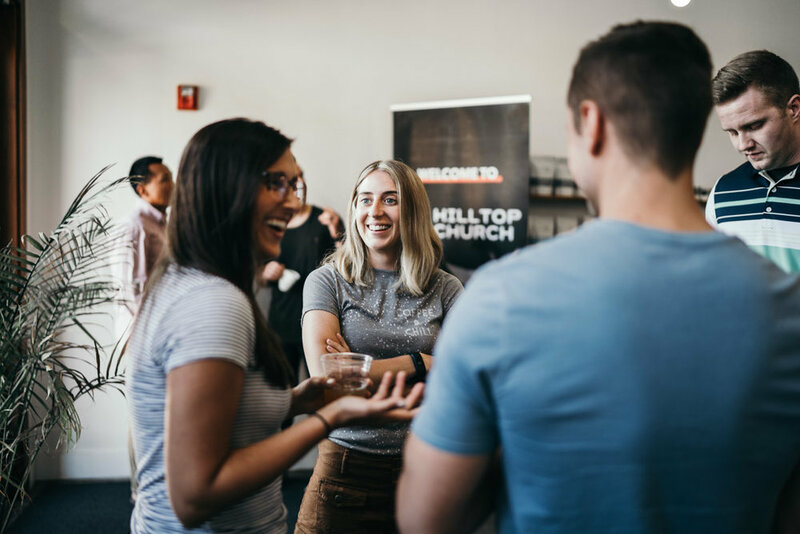 What you have learned from being on the Hilltop Launch Team? I’ve learned to rely on my own relationship with Jesus even more than before since we have not had worship and a regular message every week. I’ve learned how to be a better friend that encourages others, especially those that don’t always think or communicate the way I do. It has been so cool to see God’s faithfulness over and over; He’s provided for Hilltop in huge ways. So in a way, I’ve learned to dream bigger than before and know that God will come through. One passion in my life is loving Jesus and seeing others come to know Jesus and to become who they’ve been called to be. I love growing as a person and seeing my friends and family do the same. I want to be a lifelong learner who is continually growing. Another passion in my life is to serve youth, specifically as a teacher. I feel blessed that I get to pour into young people, even when it’s hard, as their English teacher. So of course other passions of mine are reading and writing. I never believed that God would call me to use those passions for the Kingdom, but He has.